PULLMAN, Wash. – Skin cells typically spend their entire existence in one place on your body. But Washington State University researchers have seen how the cells will alter the proteins holding them in place and move to repair a wound. 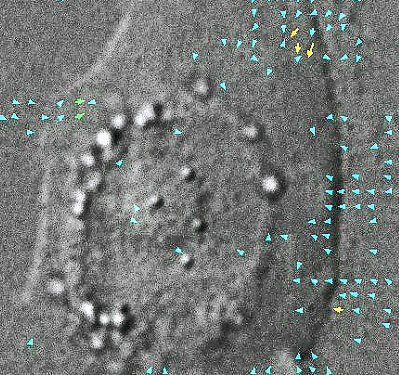 “And they walk,” said Jonathan Jones, director of WSU’s School of Molecular Biosciences and lead author of a paper on the phenomenon in the FASEB Journal. See the abstract at http://www.fasebj.org/content/early/2016/03/02/fj.201500160R.abstract. Normal skin cells are typically held in place by contact with surrounding cells and proteins that bind them to underlying connective tissue. Jones and his colleagues – post-doctoral research associate Sho Hiroyasu and graduate student Zachary Colburn – saw how cells in the epidermis will dissolve the glue that binds them and reuse some of the proteins to move to seal a wound site. The cells will also grow more cells to form new, healed skin. There are pictures. Recording through a high-resolution confocal microscope that gave them the most detailed look at the process, the researchers could watch individual cells crawl – shifting from side to side to use their outer edges as “feet.” A bed of fluorescent beads let the scientists calculate the displacement forces as each cell moved. “It’s using its internal muscle-related proteins to be able to generate these forces to allow the cell to use its feet and move along in step-wise fashion,” Jones said. The research is in keeping with WSU’s Grand Challenges, a suite of research initiatives aimed at large societal issues. It is particularly relevant to the challenge of Sustaining Health and its theme of changing the course of disease. The work was funded by the National Institute of Arthritis and Musculoskeletal and Skin Diseases, one of the National Institutes of Health. Video of a “walking” skin cell is available for media download. Go to http://mediatransfer.wsu.edu and log in using “wsunewsvideo” as the login and password. Click on the download button to the right of your desired format to send to your location machine. Please credit FASEB Journal.